The sociology of sport is a core discipline within the academic study of sport. It helps us to understand what sport is and why it matters. Sociological knowledge, implicit or explicit, therefore underpins scholarly enquiry into sport in every aspect. The Routledge Handbook of the Sociology of Sport is a landmark publication that brings together the most important themes, theories and issues within the sociology of sport, tracing the contours of the discipline and surveying the state-of-the-art. Part One explores the main theories and analytical approaches that define contemporary sport sociology and introduces the most important methodological issues confronting researchers working in the social scientific study of sport. Part Two examines the connections and divisions between sociology and cognate disciplines within sport studies, including history, anthropology, economics, leisure and tourism studies, philosophy, politics and psychology. Part Three investigates how the most important social divisions within sport, and in wider society, are addressed in sport sociology, including ‘race‘, gender, class, sexuality and disability. Part Four explores a wide range of pressing contemporary issues associated with sport, including sport and the body, social problems associated with sport, sport places and settings, and the global aspects of sport. 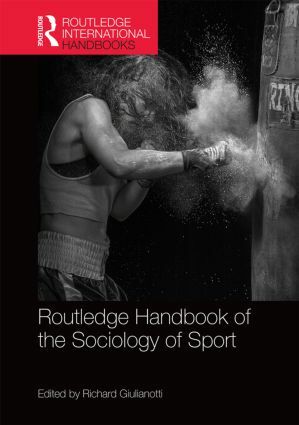 Written by a team of leading international sport scholars, including many of the most well-known, respected and innovative thinkers working in the discipline, the Routledge Handbook of the Sociology of Sport is an essential reference for any student, researcher or professional with an interest in sport.